Please note that the information in this article is meant for educational purposes and should not be used to find the location information of Photos that you do not own or belong to others. In case you were not aware, the Cameras on almost all Smartphones have GPS function built right into them. 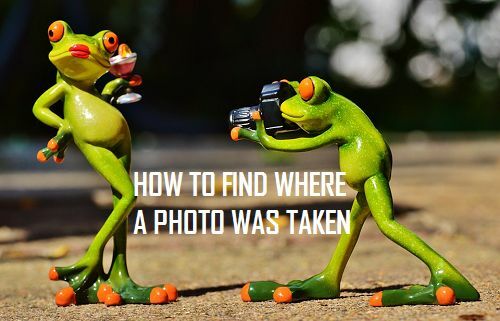 The moment you take a photo, your camera records the GPS Coordinates of the location at which the photo was taken and tags this information to the photo. This makes it easy for anyone to find out where a particular photo was taken. All that you need to do is to access the GPS data attached to a Photo and make use of this data on Google Maps or other websites to find out the location at which the photo was taken. Where is the Location Information Stored on Photos? 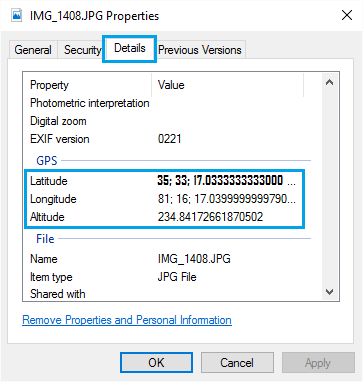 The location information of a Photo shot with a Smartphone Camera is stored in the form of Latitude and Longitude Coordinates, pertaining to the location at which the photo was shot. This information is stored in Exchangeable image file format (EXIF), along with a bunch of other data like the Camera aperture size, Shutter speed, Focal Length, ISO speed, Camera mode, etc. 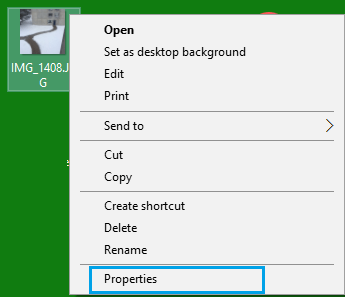 The first step would be to access the EXIF data attached to the Photo and see if it contains the information about the location at which the Photo was taken. The Latitude and Longitude information as you can see in the image above is available in the form of Degrees, Minutes and Seconds. Unknown to many users, the search function in Google Maps also allows you to search for a place by entering its GPS coordinates. 3. Within seconds, Google Maps will point the exact location, corresponding to the GPS coordinates that you just entered in the search bar (See image above). 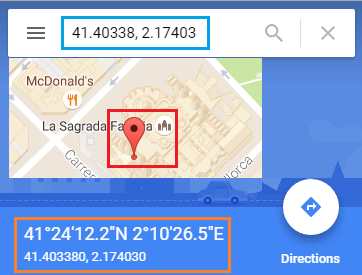 Google Maps accepts coordinates in any of the following formats. Make sure that you enter the coordinates correctly, using the correct symbols for degrees, minutes and seconds. You can enter coordinates in decimal degrees, in case you are finding it difficult to enter the degree “°” symbol. You can take a look at how to search for a place using Latitude and Longitude Coordinates in case you are still not clear about this part.